The Endmatcher Series III is a reliable, economical, and quality engineered solution for end matched timber. 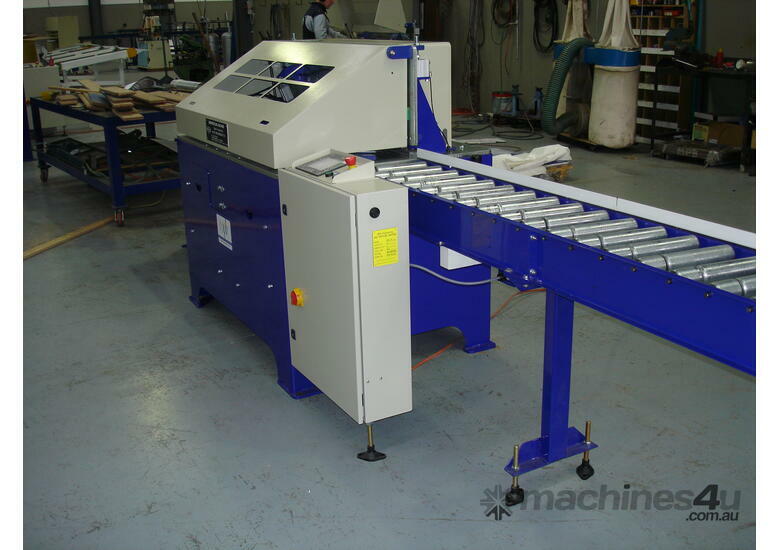 It has a very compact design while maintaining the ability to machine the largest of boards. It's compact and reliable design is accepted worldwide and is proven and used by the Australian, Asian, African, North and South American hardwood industry . 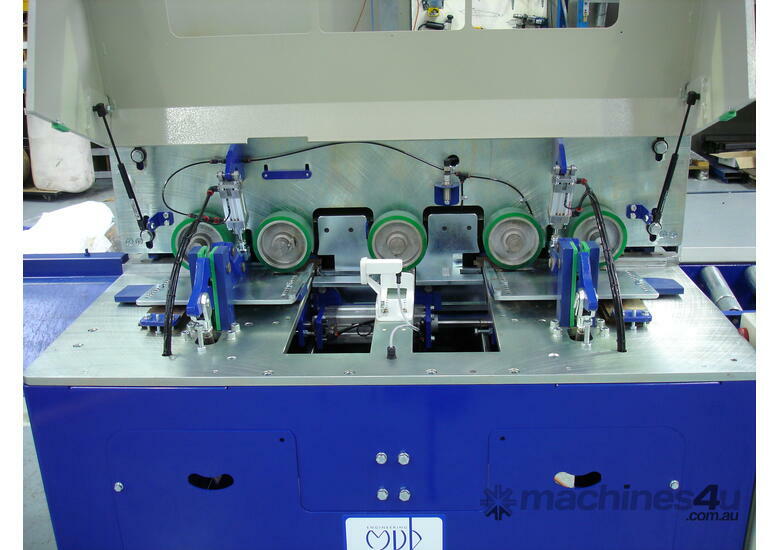 The Endmatcher obtains its incredibly high accuracy using an integrated plc, while remaining simple for the operator. The plc coupled with twin cutters, tongue and groove, and dual action clamping produces a square cut first time every time. 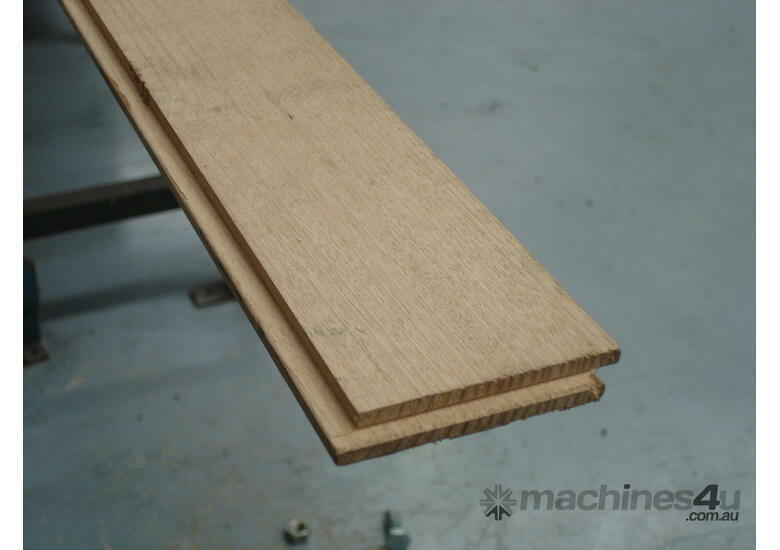 The boards are automatically fed into the machine via polyurethane top rollers and 'spring loaded' bed rollers. The Endmatcher Series III comes with a motor driven conveyor infeed of 3.3 metres in length and a 3.3 metre static gravity drop outfeed - all at no extra cost!! * SPACE SAVING: With the compact design, the Endmatcher only takes up a floor space of 1500 x 1220 mm (excluding infeed/outfeed). 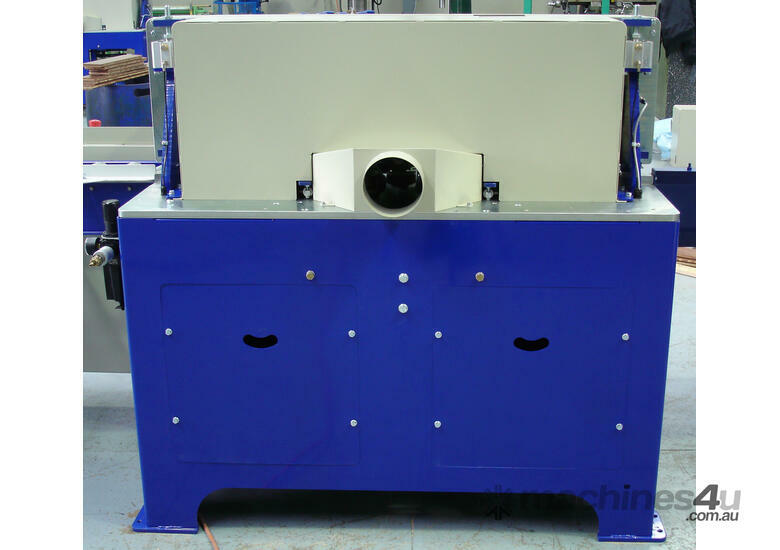 * SIMPLE, RELIABLE, HEAVY DUTY DESIGN: Ensures the machines accuracy and longevity. * TALLYING: Via the touch screen, a linear metre(feet) and/or piece count is done. 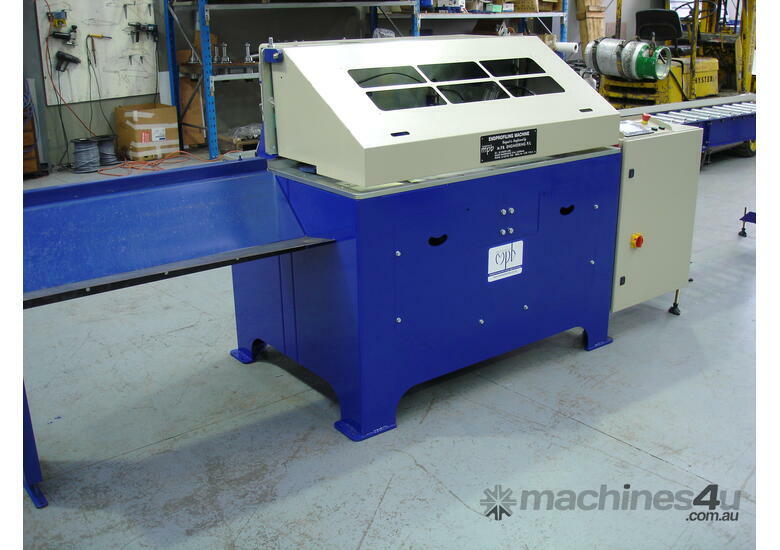 The machine can be set to stop after a predetermined metre/piece count - ideal for pack counts. * DUAL ACTION CLAMPING: This unique clamping action clamps the boards flat to the bed and square to the fence, which generates a square cut every time. 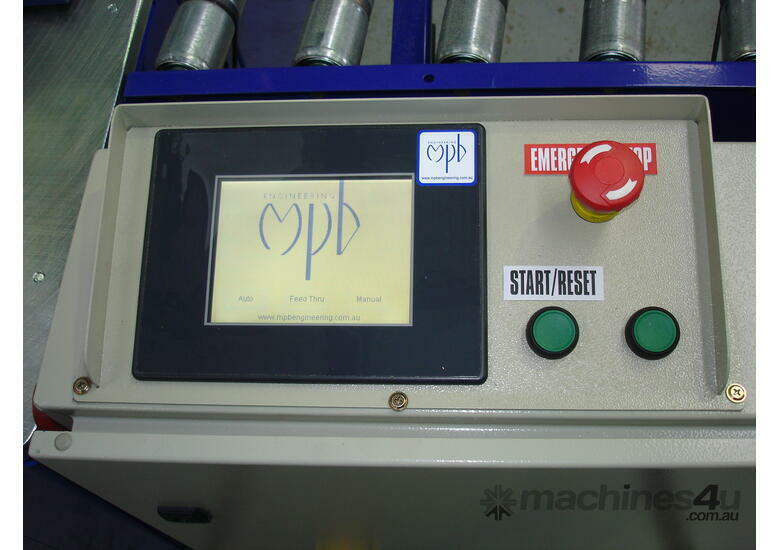 * DIGITAL DISPLAY: A display is located at the front of the machine allowing the operator to read and adjust certain parameters. * GUARD SYSTEM: A sensor full bodied guard system ensures the safety of operators and any personnel near the machine. Removable guards means there is access to all areas of the machine. * QUALITY WORLDWIDE COMPONENTS: Only high quality components such as; Norgren, Wadkin/Weinig, Sensick, GE have been used and are available worldwide. * QUICK AND EASY SETUP: No need for measurements or readouts, simply adjust the height, using the thickness setting guides, and the width, and if required, the backup blocks. In less than a few minutes the job will be done. * TOUCHSCREEN DISPLAY: Conveniently located at the front of the machine the touch screen allows the operator to read and adjust cut, feed and clamping parameters, view error messages, and operate the machine manually. * INTEGRATED PLC CONTROLS: All controls are positioned at the front of the machine in an easily accessible location. Controls are kept very simple and easy to operate and are explained on the Touch screen display - the display tells the operator what to do! While 'behind the scenes' is an integrated plc circuit, internet compatible - allows for remote diagnostics via the internet. * DUAL ACTION CLAMPING: This unique clamping action secures the boards flat to the bed and square to the fence, guaranteeing a square accurate cut every time. CUTTER HEADS: .2 x 4.0kW (5.5Hp), 3 PH. FEED: .0.75 kW (1.0Hp), 3 PH. CUTTER DRIVE: 0.37 kW (0.5Hp), 3 PH.